I love the first signs of fall. . . . . . that first day after many hot humid days where the air feels dry and even a bit chilly. It happened this past weekend. We were away moving my daughter out of her summer dorm and into her dorm for the school year. (Her senior year!) It was hot in RI where she goes to school but when we arrived home early in the evening, it was chilly. I had to find warmer pj's and put on slippers. Well, anyways, I love days and nights like that! Yup, slept like a baby with blankets and all! This kind of weather makes me want to run around and open every window in the house. It reminds me of pumpkins, turning leaves and baking anything with apples, pumpkin and cinnamon. And I love it! 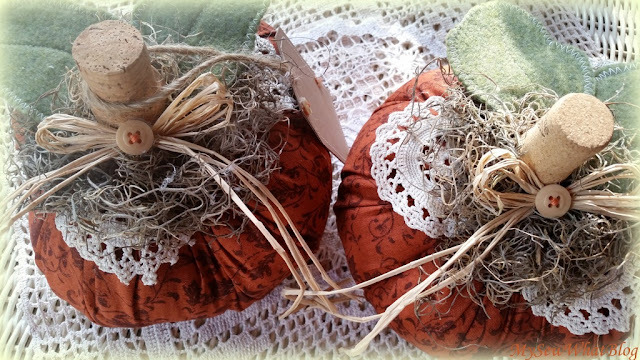 So it is not surprising that I was called to my pumpkin patch to stitch up some orange pumpkins and some smaller gourds in browns and olive green. Wouldn't these look sweet and festive placed on dinner plates for fall festivities, Halloween, Thanksgiving? The handmade and hand stitched tags are blank so that guests' names can be added. 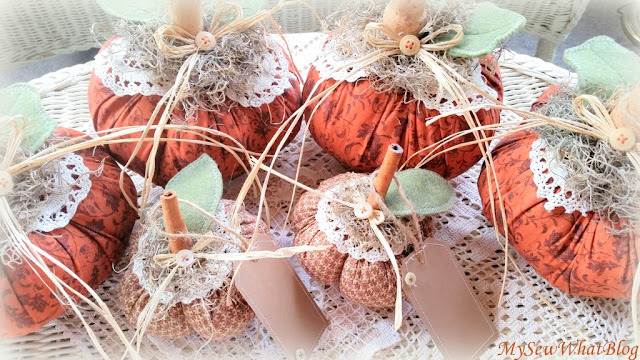 Everyone will know their places at the table and each guest gets to take home a sweet little gourd. They also look cute placed on a windowsill, a small table or in any fall vignette. 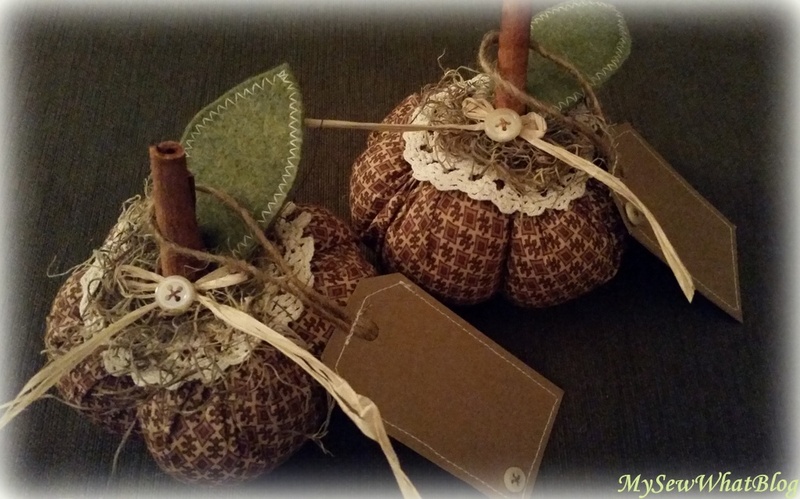 I cut several of these pumpkins out of an orange/rust and brown leaf print fabric and stitched up a few already. 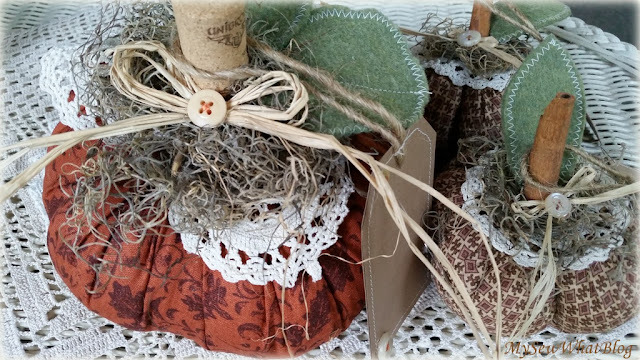 I used some crocheted doilies on the pumpkins and the small gourds to add some vintage charm and of course some natural elements: raffia and Spanish moss. I spend the year collecting wine corks to use as stems. 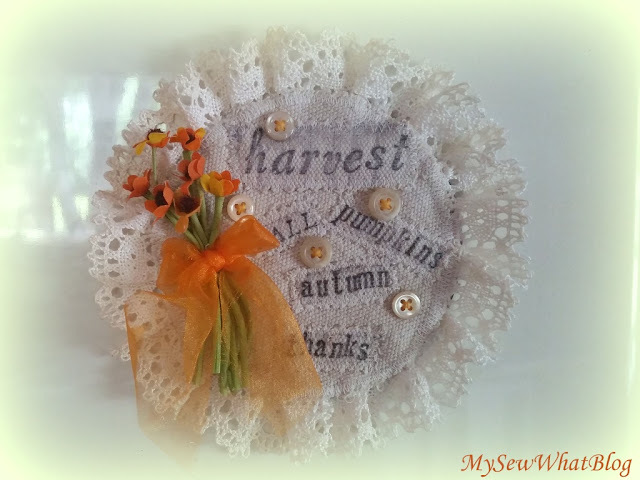 Buttons with orange embroidery thread stitches further embellish the raffia bow and the hand stitched tag. 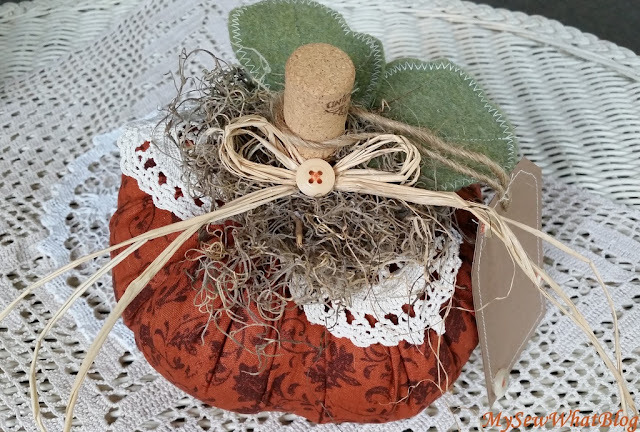 Tomorrow I will stitch up the rest of the remaining orange pumpkins and then head to the fabric stores to see what other fabrics are available for pumpkin and gourd making. 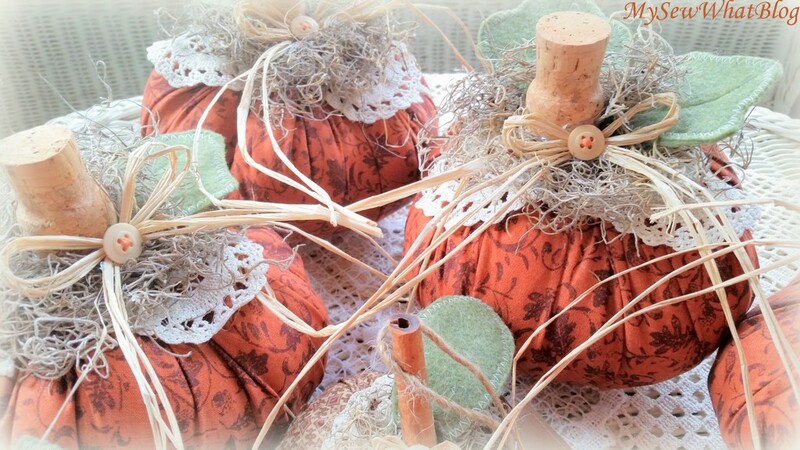 .....and a few more photos of the pumpkin patch! 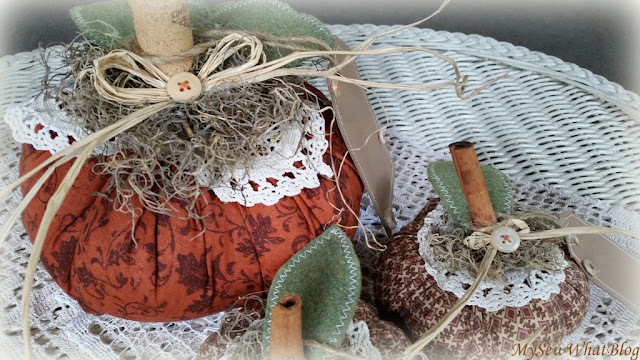 There....but before I close I have one last fall project that I made to add some fall color to my kitchen. It's a magnet that I made by recycling a CD. So as you can see, it is a pretty large kitchen magnet and holds up a lot of stuff! I love fall......just about everything about it....except for what comes next but I'm not even going there right now! 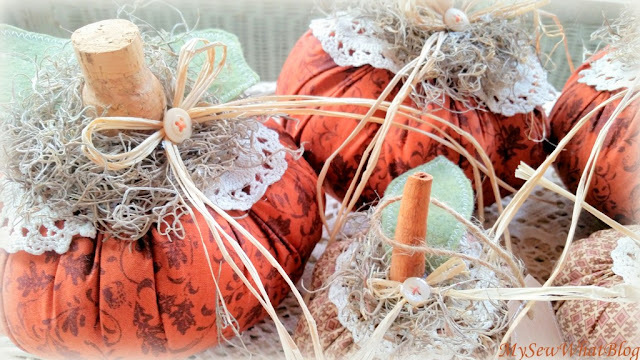 I'm just going to savor the sights, sounds and flavors of my favorite season! Anyone else seeing signs that fall is right around the corner? 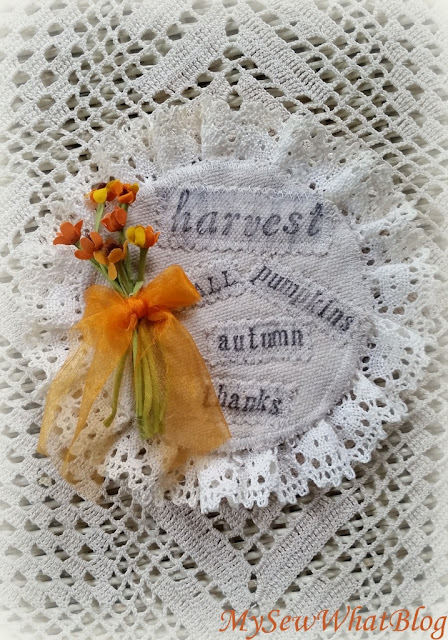 Do you love fall as much as I do or are you hanging onto summer for dear life? the year's last loveliest smile."